This is a classic puzzle, many of you have probably done it at some point in time. 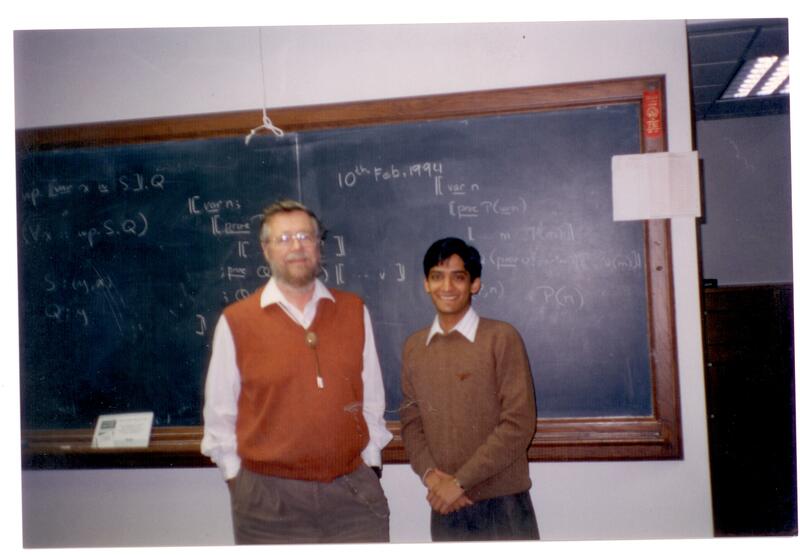 I was fortunate to have been introduced to this puzzle by none other than Prof. Edgar W. Dijkstra, who taught me a course on basic logic in University of Texas at Austin, and the question was given to me as my final exam in a 1:1 setting. Am so proud of that fact, that I am sharing a photograph from that day (at the end of the post), I am hoping that those of you who are from Computer Science background will appreciate why I feel so proud! The question in its current form is taken from one of the Martin Gardner books, Mathematical Puzzles and Diversions, Chapter 3, puzzle #4. A logician vacationing in the South Seas finds himself on an island inhabited by the two proverbial tribes of liars and truth-tellers. Members of one tribe always tell the truth; members of the other always lie. He comes to a fork in a road and has to ask a native bystander which branch he should take to reach a village. He has no way of telling whether the native is a truth-teller or liar. The logician thinks a moment and then asks one question only. From the reply, he knows which road to take.